Members of the ERTC and Friends at the 2018 Prescott Bush Dinner. 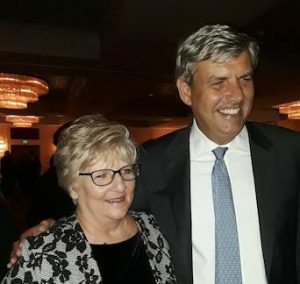 On the evening on Thursday, September 27th, representatives from the Enfield Republican Town Committee travelled to Stamford, Connecticut, for the annual Prescott Bush Dinner where local party chairman, Mary Ann Turner, was awarded the Pat Longo Leadership Award. This award is given to someone who best exemplifies leadership for the Republican Party. CT GOP Chairman JR Romano with Mary Ann Turner and her Pat Longo Leadership Award. The keynote speaker for the evening was Nebraska Governor Pete Ricketts. Gov. Ricketts talked about how applying successful business principles to government has worked in Nebraska and how it will work in Connecticut. Governor Rickets also predicted success for Republican Governor candidate Bob Stefanowski because he understands these principles. 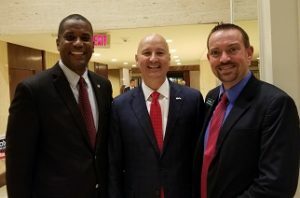 Nebraska Governor Pete Ricketts with State Senator George Logan (Left) with and Enfield RTC member Chris Rutledge (Right). Mary Ann Turner has been a long-time resident of Enfield. She currently serves on the Board for the North Central District Health Department and is Secretary for Enfield’s Zoning Board of Appeals. Mary Ann has also been Chairman of the Enfield Republican Town Committee for 12 years and is a member of the Connecticut Republican Party Committee. 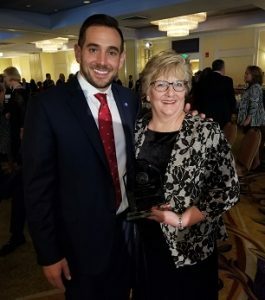 She has also been recognized for being instrumental in maintaining Republican majorities in Enfield Government for the last decade and was quintessential in achieving Republican victories in State Legislature races throughout North-Central Connecticut back in 2016. The Prescott Bush Dinner, named for the Bush family patriarch and late U.S. senator from Greenwich, is the marquee fundraiser each year for the Connecticut Republican Party. A veritable who’s who of Connecticut State Politics, the event is an opportunity to relax, converse and network with colleagues from across the state all while celebrating accomplishments and looking towards a brighter future.